No one knows what to call it, but the GT has proven to be one of the most versatile, if divisive, offerings from BMW of late. Crossover? Shooting brake? Monstrosity? Certainly it’s not room or power people are complaining about, as the GT posts some truly impressive results in both categories. What this means is that the GT looks like it has less ballast in the back end, while actually increasing space inside. Yup, the GT can fit more junk in its trunk now—a full 2 cubic feet of extra space. That means the same legroom as the 7 Series, the same headroom as the X5 and 15.4 cubic feet of cargo space. Move the rear seats forward slightly, and cargo increases to 20.7 cubic feet while maintaining the legroom of the regular 5 Series. Still not enough? Fold those rear seats flat and bask in the cavernous expanse of 59.5 cubic feet. Unfortunately, the desired visual effect on the rear end wasn’t achieved. While visually less overbearing, it’s still an ungainly setup lacking the kind of elegant integration we’d expect from the Bavarian company. That trick trunk with its two opening options just complicates things too much. It’s a shame, as it’s a useful little setup. The front end got some changes as well, with a restyled bumper and newly sculpted headlights, as well as new trim all around and several new paint options. Some new wheel designs round out the package that BMW hopes will quell complaint. For those who require V8 power, the GT has some additional surprises. The 4.4-liter V8 in the 550i was recently upgraded with Valvetronic timing as well as a new twin-scroll turbo that offers 45 additional hp and 30 extra lb-ft of torque for totals of 445 and 480. This engine is available only with the 8-speed automatic but can be outfitted with the standard rear-wheel drive or the xDrive all-wheel-drive (AWD) system, both getting 15 mpg city/22 highway. Regardless, you’ll make it to 60 in just 5.5 seconds thanks in part to the transmission handling the cog-swapping. The 535i gets no such attention, but since it comes with the venerable turbocharged, 3.0-liter inline 6, no upgrades were necessary. Three hundred is the number here, for both horsepower and torque, and this engine will get you to 60 in just over 6 seconds. In RWD configuration, it’ll get you 20/28 mpg, while xDrive will drop you to 18/27. Being a BMW, it’s not light on technology, with the option for everything from Lane Change/Departure Warning, Speed Limit warning, night vision, 3 cameras and the very complicated ConnectedDrive, which is essentially a cruise-control system with delusions of grandeur. While the interior has evolved to include some soul and beauty, there are still remnants of the shortcomings of late. For instance, the steering wheel is one of the best currently offered; it’s nice and thick and nearly free of complication. The gear selector is the exact opposite, being more complicated than needed and mostly in the way. Nearly everything else is spot on, and the iDrive system gets better with every incarnation. Your father could figure it out, I swear. For standard features, you’ll be well-appointed with xenon headlights, dynamic cruise, dual-zone automatic climate control, automatic wipers and power-heated mirrors. The optional panoramic sunroof is a highlight here, and the Sport Package with its upgraded suspension and steering wheel makes up a good amount of ground otherwise lost in this porky package. And perhaps that’s where the defining critique of the GT shines through. This is an impressive vehicle both in performance and utility, but it still fails to provide the one thing BMW has always promised: an enjoyable driving experience. Too much weight compensated for by too many electronic safety features and support systems remove the driver too much from the actual activity of driving. When electronic interference is always between you and what you’re trying to do, driving becomes something you’re only peripherally involved in. At a price like this, I’m not sure why you’d pay to opt out of the fun. 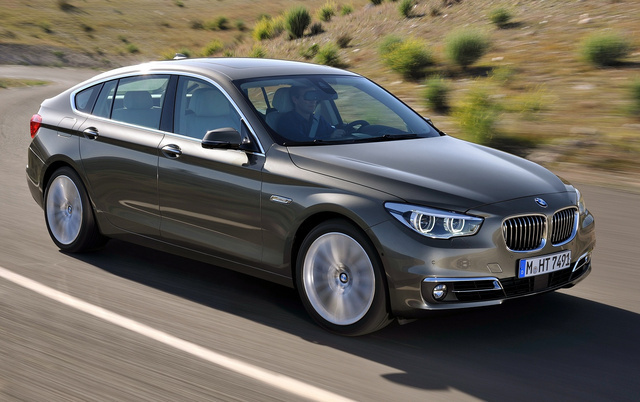 What's your take on the 2014 BMW 5 Series Gran Turismo? 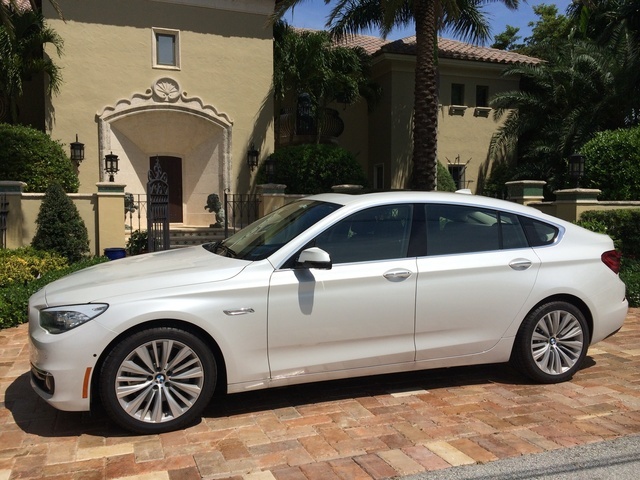 Have you driven a 2014 BMW 5 Series Gran Turismo?